Julian Carr is not your traditional business owner. If seen on the ski hill, at first, it might look like he got there by thumbing it up the canyon and copping a day pass from a buddy who drives a Sno-cat. He covers his longish hair with a classic knit beanie, like the shark expert in Jaws, and wears a button-down flannel shirt like the other guys in the ski lodge eating ramen that they brought from home. After a few moments, however, it becomes apparent that something is different. His shirt is crisp and new-looking. The colors are a little divergent—the pattern more unique. The reason for this is that he designed his hat and shirt himself. Carr will likely never be seen carrying a mug bearing the words “World’s Greatest Boss” and likely doesn’t hound his employees about TPS reports. Carr’s beanie-covered head, and the mind inside it, are responsible for Discrete Clothing—formerly Discrete Headwear. SLUG had the chance to meet with him in his headquarters looking over Exchange Place in Salt Lake City to get the lowdown on the new stuff. After a few years designing and making a variety of outdoor-oriented hats, they are branching out into clothing. Don’t be mistaken: They aren’t simply screen-printing their logo onto T-shirts and calling it good. Their designs are dreamt up by Carr and made a reality just for Discrete. Not content to join the legions of outdoor companies making brightly colored, waterproof whatever, their designs range from a sweater in the classic old-school jailhouse stripes to a puffy, quilted-denim jacket with a lining reminiscent of a Navajo blanket. Discrete Clothing was officially started 10 years ago. “When I first started skiing professionally, some of my heroes were getting a little older, and the whole industry was just dropping them,” Carr says. “I was shocked because the Tony Hawks of our world were just getting brushed to the side. I couldn’t believe it. So I was like, ‘Note to self: Have something going on besides skiing.’” His first product was a simple beanie, and the only way to get one was to personally know him and be given one. This became an unintentionally brilliant marketing strategy. People started asking him where they could get the product. After years of kicking around the idea, he did a trade show and finally started selling the headwear. “A couple weeks later, I was at Snowbird, and I see this dude walking to the tram with a Discrete Clothing beanie on. It was the coolest affirmation that I was creating something bigger than myself,” he says. Various ball caps in Discrete’s new line of headwear—their raison d’etre—were prominently displayed. Things have come a long way since those humble times. In Carr’s office, high in a tower just off State Street, glass and exposed brick complement each other in a space that Discrete Clothing shares with WELD—a marketing agency that focuses on digital experiences. Glossy prints of action-sports photos were laid out, waiting to be hung. 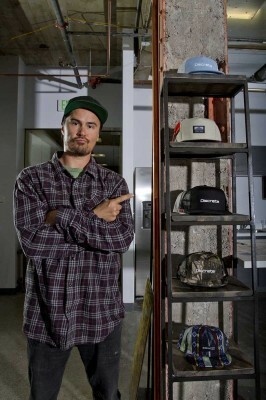 Various ball caps in Discrete’s new line of headwear—their raison d’etre—were prominently displayed, both on the shelves and worn by employees diligently working on large-screen iMacs. After only a few minutes, it was apparent that Carr will likely never be seen carrying a mug bearing the words “World’s Greatest Boss” and likely doesn’t hound his employees about TPS reports. Despite the stellar view of Salt Lake City, Carr humbly recounts the success Discrete Clothing has had and where he would like to see it go in the future. “Really, what we are aiming towards is for all the people who spend their time in really technical wear—we want Discrete Clothing to be the first thing they grab for their casual clothing,” he says. “None of our stuff is that technical. It isn’t meant to be out battling the weather all day long—we want people to be rocking it for their base layers for when they go into the lodge to grab some beer and do some après. When they’re done, they are gonna look rad and be comfortable.” Carr wants Discrete to grow, of course, though not only for the obvious reasons. He says that he wants to be in greater control of ensuring all their clothing is ethically sourced and made, and being a bigger company allows for more pull in that regard. He would also like Discrete to offer a greater variety of clothing for their customers. Flipping through their product catalog, it is clear that they are still making plenty of headwear, though their current offering of clothing items is impressive. The line is comprised of a variety of fabrics, styles and looks. Carr pointed out one particularly clever design—a base-layer long-sleeve shirt, which features a cuff that starts mid forearm. The reason for this is Carr noticed after two or three layers, it gets a little uncomfortable to have many sleeves bunching up around the wrist, so he elongated the cuff. Again, quite different from a headwear company screen-printing some T-shirts. 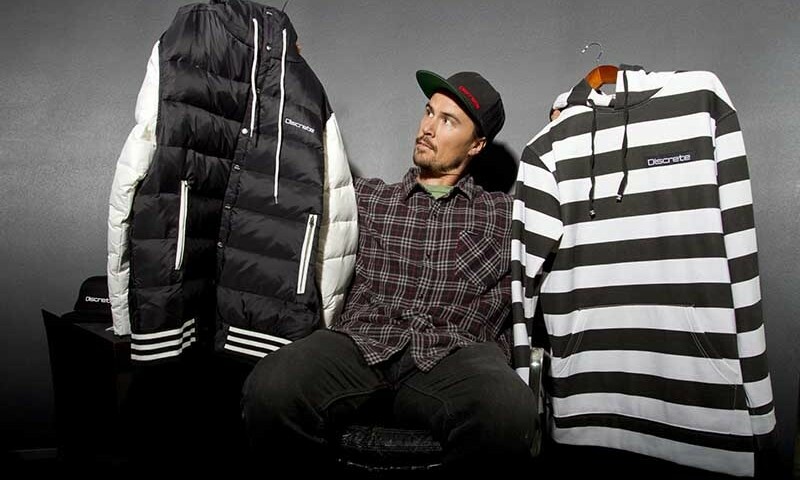 Is Discrete Clothing a ski brand? A winter sports brand? Many companies try to align themselves within a certain market to establish their roots firmly within a niche. When asked, Carr gave a simple explanation: “We respect high-level athletes,” he says. “We don’t care what’s on your feet.” Check out Discrete’s new clothing line at discreteclothing.com.